So, the ELF Studio Line has burst onto the scene with a variety of affordable makeup and the most interesting thing about it all to me is some of the innovation it’s brought with it. It’s a palette of 4 shimmering iridescent cream shades that can be used to highlight wherever you choose to apply! The ELF Studio Line packaging has been consistently good, more than slightly reminiscent of NARS… everything I’ve bought or been given has a solid feel to it and this is no exception. 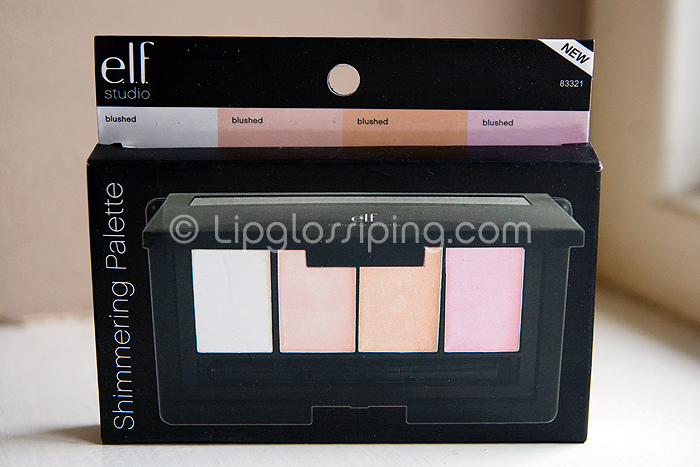 The 4 shades included range from white through to a couple of peachy/gold colours ending with a pink. All are very wearable shades. Although I have no idea how they would look on deeper skintones. The consistency of the creams are slightly greasy which means that they blend very easily but need setting to stop them sliding. The colours are also surprisingly pigmented until you blend them out into a nice sheen. 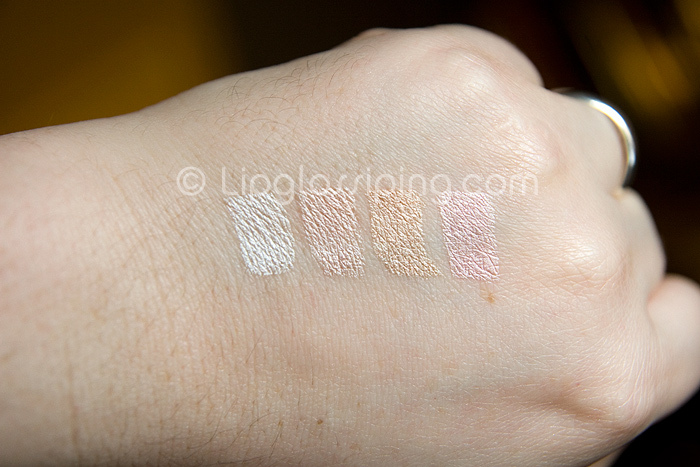 You can see the iridescence in the shades in this swatch, I’ve tried using them on my cheekbones… I like. I’ve tried using them on my eyelids… um, not so much like (too greasy). I’ve yet to try them on my lips… I don’t really see the point. Someone give me some more ideas of how to use! You can see the colours a little better here. 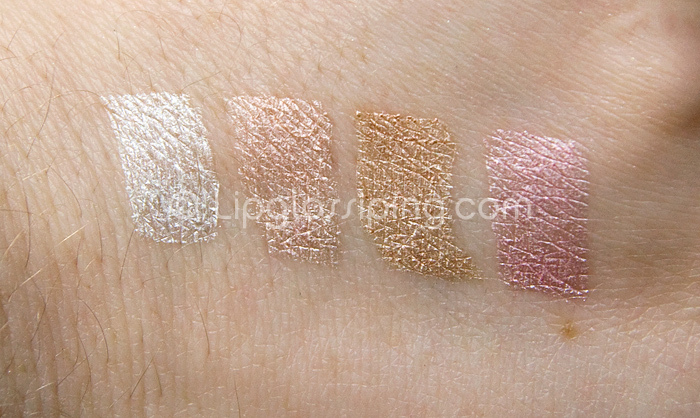 So, overall ELF’s Shimmer Palette is a nice, fun product. It’s easy to use and does what ELF intended it to do… add a bit of shimmer an sheen wherever it’s used. I’m not sure that I’m going to reach for the palette that often, I don’t really have much need for it… however, I will be buying some as Xmas pressies for a couple of young teenage girls in the family. I think it would be awesome for that “too young to wear full on slap – but wants to play with makeup regardless” age. 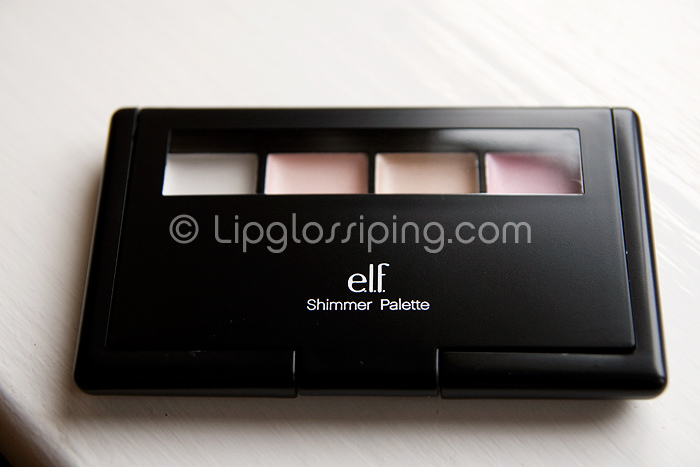 Have you tried ELF’s Shimmer Palette – what say you? This is the one product I didn’t buy when I went a bit wild during their US 75% off sale. Here’s a few ideas. – a tiny bit outlining the cupids bow. It will enhance it. Sounds like it would be perfect for younger girls though. Oh yeah brow and inner corner definitely! That looks pretty but I just can’t handle shimmery blushes. Some are okay but others are just crazy… especially in day time. So I’ll pass on this one! I am LOVING the HD powder! My skin feels so beautifully smooth and my foundation and blush are lasting a whole lot longer. Not to mention it does seem to ‘diffuse’ because unless I get to within an inch of a mirror I can’t see my dry bits – Hoorah! I’ve read somewhere that you should highlight above the eyebrow as well as underneath. After your posts I ordered loads of ELF bits and I am also really impressed. I got the HD powder which is fab and is now replacing my Bare Minerals Mineral Veil. I also got some brushes which are really good and the Nars dupe for Blush and Bronze. Thanks for the swatches!! is the colour that visible for you have apply a few times? actually i just need abit of glow..haha. how did you compare this to the NYX eye shadow pencil. for eg, there is white here witht the nyx milk? i never purchase either of them yet. 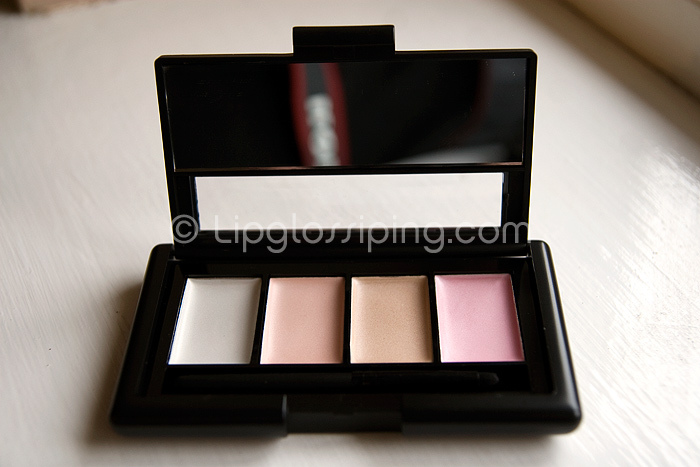 as us say subtle shimmer means it cant be use as a light colour of eyeshadow to mix witht the darker color. This isn’t anything like the NYX jumbo pencil, that’s *really* pigmented – completely opaque and doesn’t contain any shimmer. 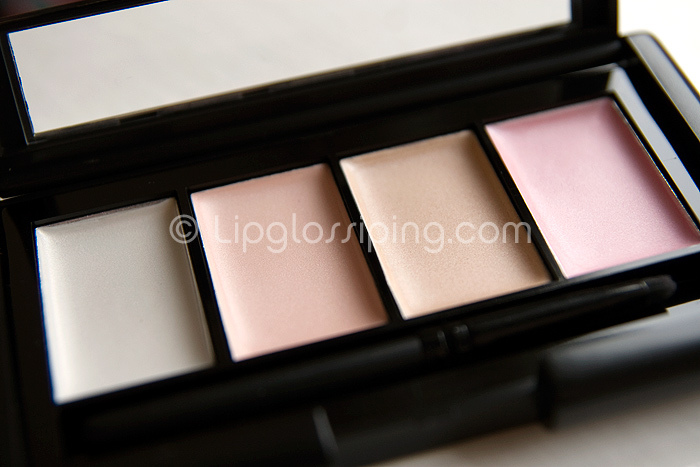 The Simmer Pallette from e.l.f. can be used in all the ways that are listed already here there are many good ideas. The way I have used it as well as some of their cream eye shadows that are light and also shimmery is to apply over a darker powder shadow by patting lightly with some of the shimmer on a finger. Not completely covering the darker color, this seems to set the shimmer or shimmer first and powder on top keeping the colors in the same family. e.l.f. has a color transformer that has 4 light colors that are powder that cordinate, by coincidence, with their corectors, that I do the same thing with. This creates a nice effect altho its light on light. I just happen to be in love with e.l.f. right now. I love this palette from elf. I love blending it with my blush and sometimes on my lips. Clinique CC Cream, all that and a bag of chips? Deal Alert (London): Elemis Amnesty Tomorrow!